The most essential act of worship any Muslim performs on a daily basis is Salah. This prophetic ritual we repeat 5 times a day is an intimate conversation with Allah (swt) and full of beautiful adhkar (statements of remembrance) and wisdom. To truly grasp the benefit of prayer and perform it with an attentive and tranquil heart demands that we do our best to understand and appreciate what is said during it, to connect ourselves with the deeper spiritual benefits of why we utter specific words and perform specific actions. Make Salah an experience. 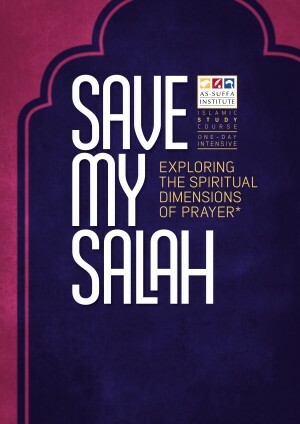 Join us for our ‘Save my Salah’ Islamic study course and learn the beauty behind each word and action of your daily Salah. Take this journey and change the way you communicate with Allah. As-Suffa Institute has brought you this course in the hope that it will serve to revive the consciousness of Allah in your prayers, by taking you initially through the ways in which you can prepare yourself physically and spiritually before the prayer commences. Ensuring that all the etiquettes are understood, you will further explore how to achieve and retain your ever-needed focus throughout the prayer. Along with learning the meanings of the words you repeatedly recite, you will also explore the deeper meanings and exegesis of the essential words to help achieve a state of God-consciousness throughout the prayer and beyond in sha Allah. The prophet Muhammad (SallAllahu Alaihi wa Sallam) suffered immense hurt and suffering. Emotionally, his father passed away before he was born, his mother when he was only 6 years old, then his grandfather only 3 years after that. Living a very rough life as an orphan. Even later on as a messenger, his troubles, his trials and tribulations only increased when he received revelation. He was humiliated and tortured. All types of the nastiest names were hurled at him (SallAllahu Alaihi wa Sallam), being called a sorcerer, a liar, a poet. The messenger (SallAllahu Alaihi wa Sallam) was put under an economic boycott, he loses his uncle Abu Taalib who was his source of physical protection, he loses Khadijah (RadiAllahu anha) who he first went to when he had the first experiences with revelation. She was always his source of comfort, his moral and emotional support. Thereafter the messenger (SallAllahu Alaihi wa Sallam) goes to Taif for Da’wah, and here, narrations mention that he used to say to Aisha (RadiAllahu anha) that this was the worst experience of his life. And in that very context, Allah calls the prophet Muhammad (SallAllahu Alaihi wa Sallam) up through the heavens, to give him this special gift. What was this gift? That gift was the gift of Salah. In essence, the reason why Allah gave the messenger (SallAllahu Alaihi wa Sallam) this gift in this context; Allah allowed him to experience all the bitterness of this world, so that he could fully appreciate the sweetness of prayer. The only command that was received in the heavens and not on the earth, the prophet (SallAllahu Alaihi wa Sallam) was raised up, likewise, as the great scholar al-Imam Hassan al-Basri said (RadiAllahu anhu), “Prayer is the Ascension of the believer”. To speak directly to the one that the prophet Muhammad (SallAllahu Alaihi wa Sallam) spoke to. Which is why the prophet also said, “The coolness of my eyes was placed in Salaah”. God gave it to him as a gift as an escape from this world, so that he could taste the sweetness of that relationship with God. Whenever anything troubled him, he would always run back to that prayer and find that comfort, that embrace in Salah. Allah breaks us away from the Dunya (this world) at least 5 times a day so that we can also put things into perspective and understand that true happiness and contentment lies in conversing with the most high, in speaking with Allah and turning back to the creator. 1. Understanding the importance and value of the Prayer. 2. Understanding all about the actions before Prayer. 3. Deep understanding of building khushu in the Prayer.